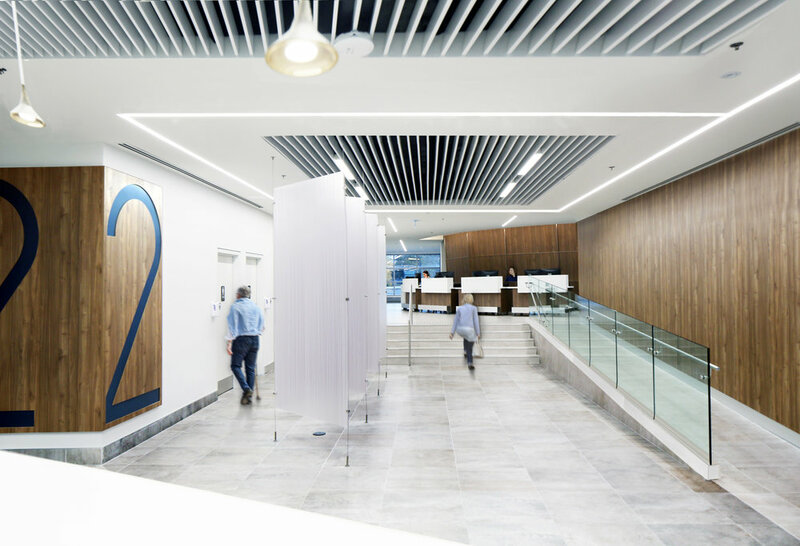 One Heart Medical Centre is a revolutionary design that offers clients a bespoke experience that streamlines the cardiac medical process. By hosting a number of cardiology-concentrated services under one roof, One Heart Medical Centre (One) provides both diagnosis and remedial treatments. 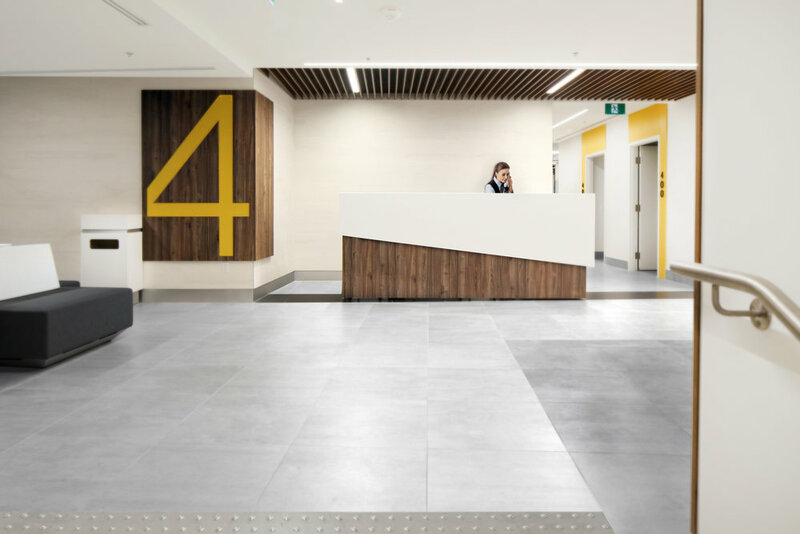 Careful planning and architectural design promote a hospitable atmosphere with a circulation that is beneficial to both staff and rehabilitating patients. The layout is easy to navigate. The clinic is divided into four distinct, colour-coded zones. Each zone (or pod) offers a specific cardiovascular service and treatment. 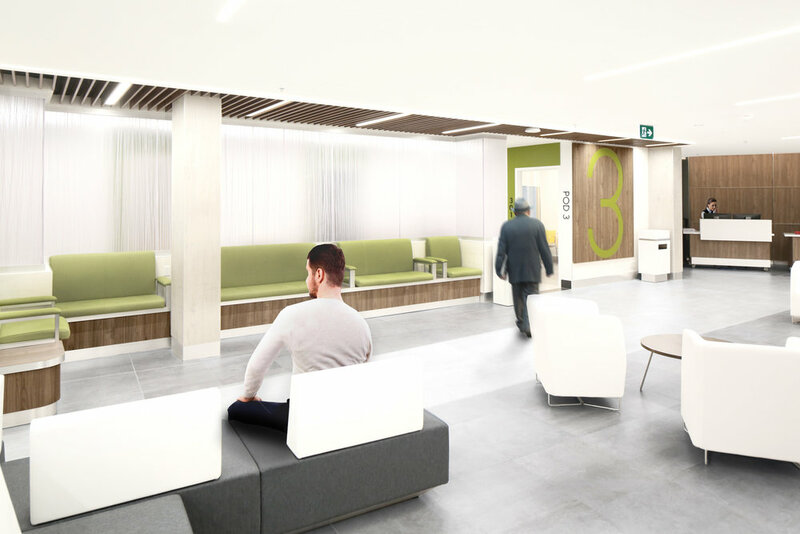 The vision of the clients—a group of cardiologists — who have come together from Trillium Health Partners with three locations in Mississauga—was to design and offer the country’s most comprehensive, state-of-the-art cardiac centre. Strategically sited, the newly opened facility provides a home to accommodate the clients’ ambitions of a state-of-the-art cardiac centre with room to grow. Efficient in plan, the carefully-designed circulation stems from an in-depth research with regards to the flow of a contemporary cardiac centre. Our design team studied the existing building envelope, conducted observational exploration of similar facilities, and reviewed successful, global case studies in order to understand the current and future requirements of such a facility. This results in an architectural design that enables an unparalleled, efficient and pleasant experience. Serving emotionally-exhausted patients with heart conditions, the professional and comfortable setting of ONE Heart features bright and cheerful spaces. The entrance invites the patients and their company into the first floor where an elegant, double-height hallway leads the way to the second floor by way of elevators/stairs. The majority of the services reside on this floor, beginning with the main reception. The design strategy divides up this floor into multiple pods; three are dedicated to examination, one for nuclear stress/imaging, and one for educational, research and operational purposes. Each pod has its own smaller reception, receiving patients and ensuring an efficient flow of foot-traffic. 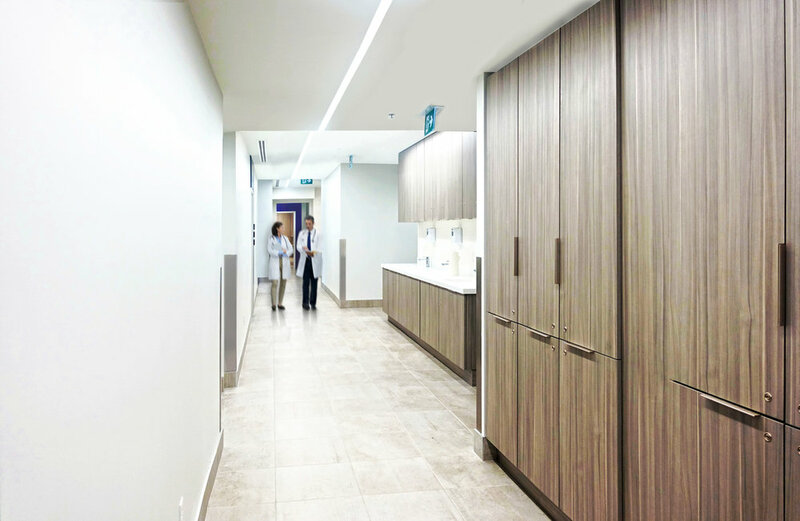 Within every pod, the doctors’ offices are situated in close proximity to three exam rooms, and the distance between the pods are calculated with allowance for staff short-cuts, minimizing wait-time and maximizing patient-care. Mezzanine floor is completely dedicated to staff. Generous in space, these areas offer a comfortable and quiet atmosphere for ONE Heart Care’s medical professionals. 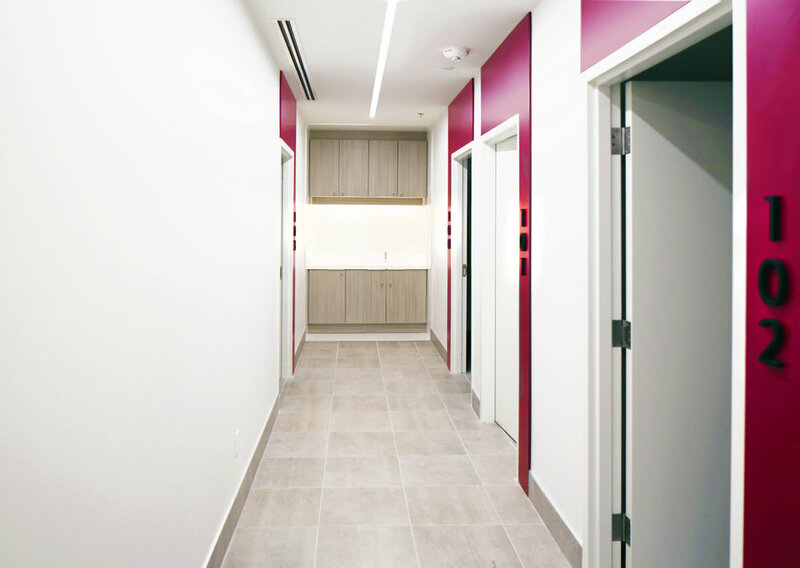 For easy maintenance, our design team developed a form/material strategy: white porcelain tiles (non porous), wood panels and stainless steel with linear light fixtures. As an accent, black tiles frame the various thresholds. 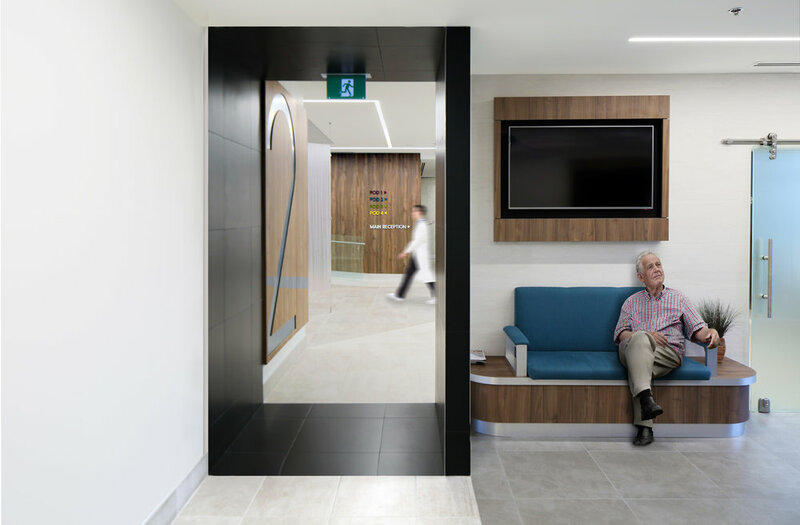 Instead of doors that serve as dividers in hospitals, the black frames—stretched from floor to ceiling—separate the spaces, mark their entrances and create sufficient boundaries without disrupting traffic. The existing Building Automation System was retrofitted and upgraded for medical requirements. Our design team developed multiple temperature zones that are both energy efficient and effective. The temperature zones are based on the building’s orientation and code, some needing more heating equipment and some more ventilation technology. Fresh air and natural light penetrate certain spaces while artificial lighting, along the walls and ceiling, brighten the hallways. Easy to navigate and pleasant to spend time at, ONE Heart Medical Centre is a place to come together and combat the difficulties of heart disease.